From its beginnings as a Navy base during World War II to its present-day status as the Island’s only commercial airport, the Martha’s Vineyard Airport has seen a number of airlines come and go. For the past 20 years the main, year-round airline has been Cape Air, with a seasonal presence from U.S. Air bringing in flights from New York and Washington, D.C. This summer, two new airlines began service to the Island. JetBlue and Delta are flying from New York’s John F. Kennedy International Airport and will continue service until Labor Day. 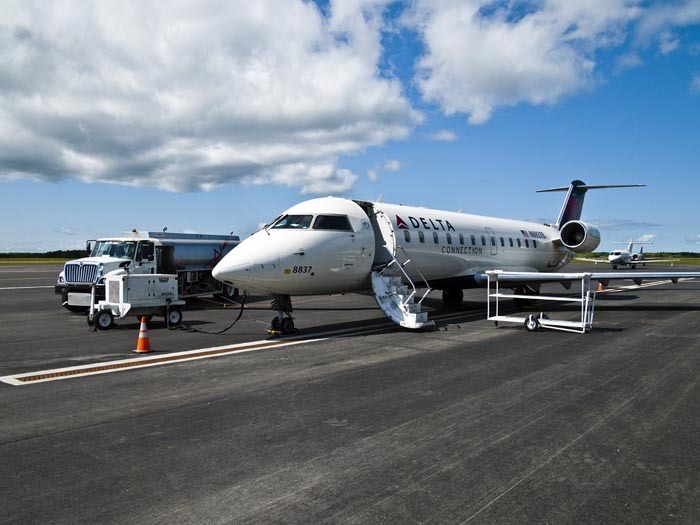 The JetBlue flights, which until June 16 will be coming in once a day, Thursday through Monday and daily after June 16, are being operated by the Cape Air ground crew. Delta’s flights are operated by Pinnacle Airlines which also operates the U.S. Airways flights through its subsidiary, Mesaba. Airport manager Sean Flynn explained the confusion. “The aircraft aren’t always operated by the company that’s on the side of it [the plane]. It’s like when the high school has a private contractor. It might say Martha’s Vineyard Regional High School on the bus, but it says operated by someone else on the bottom,” he said. JetBlue is flying an Embraer 190, 100-passenger jet, on flights from New York, and Delta is flying a 50-passenger CRJ-200. Because of the great reach both of Delta and of JetBlue, much has been said about the potential to bring in visitors from Europe or from across the United States. Mr. Flynn said he will be curious to see how many passengers travel only from New York to the Vineyard or connect to New York from somewhere else in order to come here. But he won’t know until the season ends. Mr. Flynn, along with the manager of the Nantucket airport, hopes to convince at least one of airlines to stay during the off-season and provide year-round service between New York and the Vineyard. “It’s probably a dream on our part,” he said. As for summer logistics, the airport manager is upbeat. “Most of the logistics have to do with the construction, just because the airfield was changed so much,” he said, taking the opportunity to correct an earlier Gazette story by noting that the runway has not been expanded, only updated. Congressional mandates require a safety area at each end of the runway of 1,000 by 500 feet. To comply, the airport relocated 300 feet of runway from one end to the other and will be updating their ramp this fall and winter. “We’re only going to build what we absolutely need,” Mr. Flynn said. Back to the two new flights, he said they will be relatively easy to accommodate. In a 90-day season, the two operations a day, if they ran at capacity, would increase annual enplanements from 50,000 to 65,000. “The impacts are a little bit more in the terminal because both of those flights come in practically on top of each other,” Mr. Flynn said, but here again, he said the airport terminal has plenty of space to handle the extra traffic. “The terminal building itself was designed to handle a lot more people than it handles now,” Mr. Flynn said. The airport offers free Wi-Fi and has added new furniture outside the terminal, including an outdoor waiting area beneath a white tent. And an extra gate has been added for Hyannis and Nantucket flights under the pergola by the parking lot. In recent weeks, more passengers have been coming in than going out, but Mr. Flynn expects that to change soon enough. And despite the near-daily arrival of bigger jets flown by Delta and JetBlue, he said the amount of paperwork has not changed appreciably. The airport is certified to handle planes of that size from its days providing DC-9 service. JetBlue does require more paperwork for the ground crew than Cape Air. Colin Ewing, station manager for Cape Air who now takes care of JetBlue’s ground operations as well, said paperwork is required for landing, boarding and baggage claims, because JetBlue likes to track statistics. “There is a lot of paperwork. There’s probably seven or eight different forms. Everything is recorded,” Mr. Ewing said. But he said the main difference between handling a Cape Air flight and a JetBlue flight has to do with volume. “[One JetBlue flight], it’s like 11 of our flights,” Mr. Ewing said. He admitted that the crew was a bit nervous before JetBlue arrived, but said everyone is now feeling comfortable with the equipment and style of operation. For Mr. Flynn the main benefit that JetBlue and Delta bring is access. “It’s access for residents. It’s access for visitors,” he said. Others agree. “It’s increased our business because we get a lot of walk-ups,” says Joyce Graves of Budget Rental Cars. “It makes the Delta flight look smaller,” she laughed, as she described watching a JetBlue flight take off. Even this early in the season, the counter staff was busy with passengers.